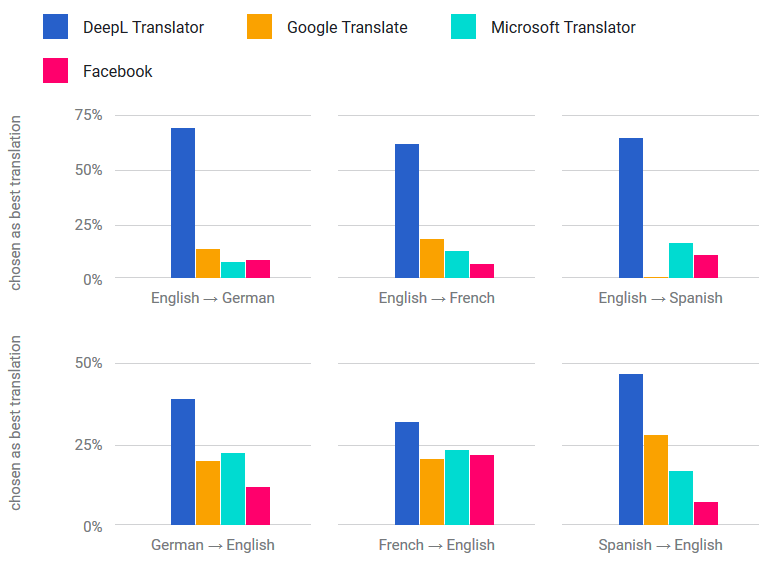 Tech giants Google, Microsoft and Facebook are all applying the lessons of machine learning to translation, but a small company called DeepL has outdone them all and raised the bar for the field. 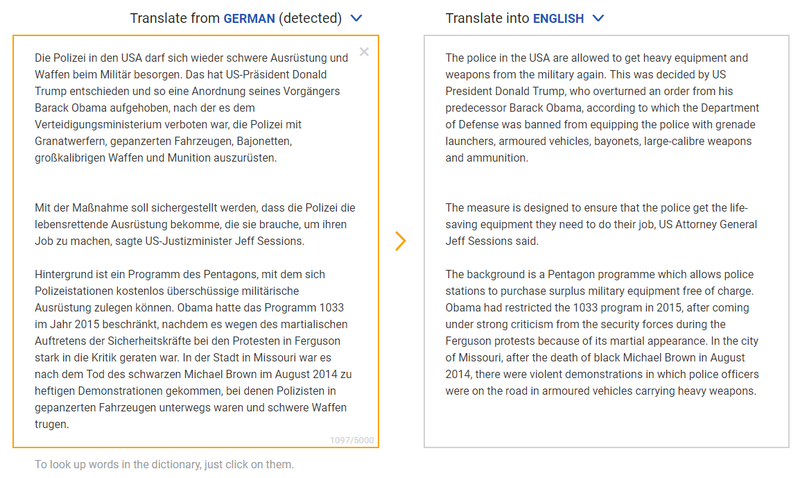 Its translation tool is just as quick as the outsized competition, but more accurate and nuanced than any we’ve tried. I only speak a smattering of French in addition to my passable English, but luckily my colleague Frederic is a man of many tongues. We both agreed that DeepL’s translations were generally superior to those from Google Translate and Bing. A few tests of my own on some French literature I know well enough to judge had DeepL coming out on top regularly, as well. Fewer errors of tense, intent and agreement, plus a better understanding and deployment of idiom make for a much more readable translation. We thought so, and so did translators in DeepL’s own blind testing. But don’t take anyone else’s word for it — test it out yourself. While it’s true that meaning can be conveyed successfully despite errors of that class, as evidenced by the utility we’ve all found in even the poorest machine translations, it’s far from guaranteed that anything but the barest facts of will make it through. DeepL was born from the similarly excellent Linguee, a translation tool that has existed for years and, while popular, never quite reached the level of Google Translate — the latter has a huge advantage in brand and position, after all. Linguee’s co-founder, Gereon Frahling, used to work for Google Research but left in 2007 to pursue this new venture. The team has been working with machine learning for years, for tasks adjacent to the core translation, but it was only last year that they began working in earnest on a whole new system and company, both of which would bear the name DeepL. An enormous database of over a billion translations and queries, plus a method of ground-truthing translations by searching for similar snippets on the web, made for a strong base in the training of the new model. They also put together what they claim is the 23rd most powerful supercomputer in the world, conveniently located in Iceland. Developments published by universities, research agencies and indeed Linguee’s competitors showed that convolutional neural networks were the way to go, rather than the recurrent neural networks the company had been using previously. Now isn’t really the place to go into the differences between CNNs and RNNs, so it must suffice to say that for accurate translation of long, complex strings of related words, the former is a better bet as long as you can control for its weaknesses. For example, a CNN could roughly be able to be said to tackle one word of the sentence at a time. This becomes a problem when, for instance, as commonly happens, a word at the end of the sentence determines how a word at the beginning of the sentence should be formed. It’s wasteful to go through the whole sentence only to find that the first word the network picked is wrong, and then start over with that knowledge, so DeepL and others in the machine learning field apply “attention mechanisms” that monitor for such potential trip-ups and resolve them before the CNN moves on to the next word or phrase. There are other secret techniques in play, of course, and their result is a translation tool that I personally plan to make my new default. I look forward to seeing the others step up their game.